I’ve gone through Lyons time out of mind, ever since it was a single-lane dirt road up to Estes. There in its bowl of beautiful sandstone red cliffs is Lyons, Colorado, an attractive little town, a memory of the Old West, once strategic at the confluence of the two Saint Vrain Creeks, and at the exact point of rising of the Rocky Mountains. Now it’s a gateway to Rocky Mountain National Park and the exact location of South Creek Ltd., where Mike Clark builds internationally celebrated cane fly rods. I think of what it must be like to come to Mike’s place for the first time, of the suspense, and excitement of it all. 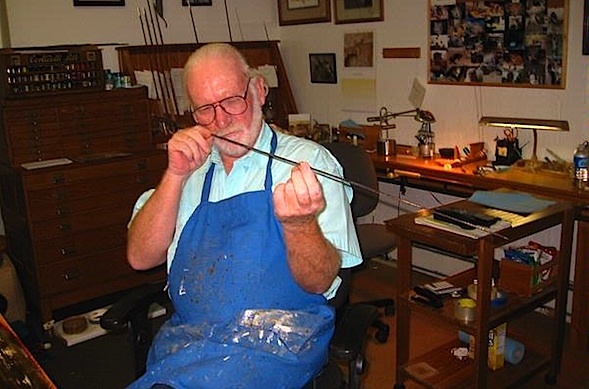 An angler of my imagining may have made the momentous decision to move beyond his round graphite rods and get himself a lifetime treasure: a custom-built cane fly rod from the hands of the distinguished Mike Clark. A bundle of nerves, our angler pulls up in front of the fine old-time red sandstone business building on the south side of Lyons’s one-block-long Main Street and wonders at the deep purple trim of Mike’s store front. Purple! Once out of his car, he timidly peers though the old-fashioned store windows, to see what he can which is not much. But what he can see is altogether different from what he’s come to expect at “fly shops.” There’s none of that “Come On In, Anglers — Big Sale Today” enticement common and identical to identical fly shops everywhere. This place is different. Our client, with some trepidation, opens the front door and steps into the deep quiet of a twelve by twenty room, inimitable and unique, filled with angling gear and artifacts, with racks of antique and restored cane rods, cases of reels, lines, books, invaluable collections of old flies on the walls, and new flies expensively for sale– all selectively stocked and displayed, first class stuff, in fine cabinetry and under enticing glass. Good Grief! Just look at it! Fine trout art graces the walls, even the carpets underfoot. High on the east wall is a painting on board by Ken Iwamasa of a brown trout seven ( ! ) feet long that I have long coveted. In each front corner of this front room are great signature racks of Tonkin bamboo culms, racked from floor to ceiling, stunning in their wheaten beauty and exotic provenance. That most wondrous, heavenly, of grasses, good for almost everything, out of which nearly everything needful to human life can be made. Our client, now in overload, awe-struck at all the stuff so cunningly and artfully displayed, moves carefully, if not gingerly, about, wondering what to do next, trying hard to take it all in as fully as he can. This is no ordinary “shop”: it is in fact a studio, an atelier, where a master might hold sway and court important clients who want to commission a masterwork. There’s a peculiar formality and classical character to it. It’s too much to take in all at once; the client tries to pull himself together, before “facing the music” — for there, straight in front of him, curtains draping the entry, is the work room proper. Clark’s work bench is dead in the center with the master himself standing at the right, at his steel planing forms. Just a bit impatient at being interrupted in his work, in a moment he comes to meet our client, with that notoriously enigmatic smile, good looking, what with that curiously gray-blonde seaman’s queue dipping down his back. Our client feels on the spot, uneasy, off balance, not sure whether he’s exactly welcome or not. He steals glances at the myriad and compelling details of this larger work room, everywhere, up and down, in every corner, on every wall, on every shelf, in every nook and cranny, rod building stuff to excite the angler’s fascinated curiosity. This is the back room of a veritable museum where treasures are stored and the hard work done. Then, anxious for a hint, for some help with what’s next, he spots Kathy at her work bench along the west wall. There she sits, Kathy Shulkin-Jensen, winding the guides to a rod, maybe one Mike has just finished — or perhaps a fine old Payne or Granger sent in for her to restore to its original glory. You may have seen old-time photographs of the famous old rod building shops of the past. Men building the rods, women finishing them. They were invariably a frumpy looking lot, badly dressed, and embarrassed by the camera. Cane fly rods? They could as well have been making ax handles. 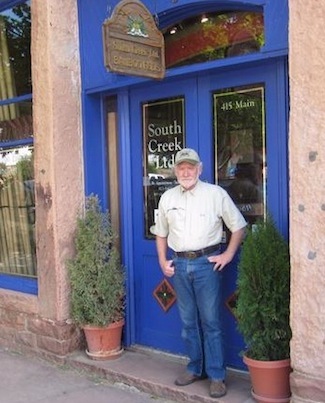 But here in Lyons, in Mike Clark’s South Creek, the woman, in this extraordinary shop, is Kathy, of the nicely hyphenated name, a woman, tall, dark, slender, smart, aristocratic, slightly exotic, her powerful eyes full of intelligence, vitality, and welcoming. Kathy rises from her bench to greet the client, her hand extended. At last he begins to feel welcome while still swamped in the allure of the place. At this point, allow me, your author, to step in and take over from that imaginary “client.” I’m here in his place now in the back room of this studio to talk to Mike and Kathy to learn all I can for this very article. Where, for instance, do Kathy and Mike come from! This is clearly Mike’s studio, his creation; it predates Kathy. But for these last eight years, she’s been here, Kathy, graceful, glamorous, finely spoken, more often than not taking over from Mike to explain the ins and outs of ordering a rod, explaining why it will take four and a half years to get high enough on the list for Mike to build it. She lionizes him. She explains how a client will, in time, come to choose his rod’s every cosmetic detail and casting characteristic. 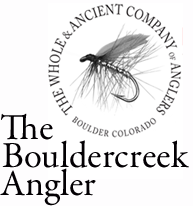 Every rod from South Creek Ltd. is altogether custom built for the particular customer, there being no “standard,” no “name-brand” grade to be had. She’ll help him choose. 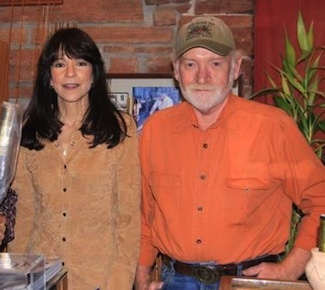 When Kathy joined Clark those eight years ago, when she and her husband moved to Lyons from California, neither of them knew the first thing about fishing, fly or otherwise, but quickly “got into it,” even taking some lessons. Mike had come to that point in his business where he needed help. Someone to wrap the rods would help a lot. Somehow Kathy wandered into the picture and was sent home to practice wrapping to see if the work suited her. It did. She learned quickly and mastered it. From that point on she became a lover of cane rods herself, rods old and new. And, she says, with Mike at her elbow, she planed and built a rod of her own — so she knows, at what she calls her “modest level,” how it’s done. She refers everything back to Mike, “Mike says this,” “Mike believes that.” She told me that when a customer comes in, she can help him a lot, but the customer has to be assured that he’s going to get a rod that Mike built, not the work of an “apprentice.” She would never presume to split or plane a strip of cane for Mike. She’d never dip a rod in the final varnish. I noticed that Mike himself was doing the final rub-down polish on a set of his glowing sticks. Interestingly enough, Kathy began to take on the simpler repair jobs on rods that anglers brought in. This led to her successful rod restoration service. She’s inordinately proud of the pains she takes to restore an old rod to as nearly its original, authentic condition as possible. She specializes in careful research into the rod’s original, right-from-the-manufacturer condition. She tells me how wonderful it is to have all those great rods of the great cane rod tradition passing through her hands. She feels it’s a privilege — and an inspiration — all those old Paynes, Leonards, Grangers, Gillums, Thomases, Garrisons, Powells! Kathy not only wraps, repairs, and restores rods, and does the book work, but she’s often out fishing herself, usually with Mike. Of her pleasure in fishing, she says that “you can’t go anywhere but fishing when you’re fishing.” That’s deep and bears remembering… She speaks of fishing’s utter and healing need for concentration and regrets all the years that she didn’t do it. A momentary cloud passes over our conversation, when she remarks that she would not fish alone — a woman ought not to. … I think of my daughter’s exact, same sentiment. It’s sad. She wanted me to know that she could never before have imagined her life in a business like rod building; yet, she was not altogether unprepared. She had worked professionally in businesses in California — and had been raised around the fine hand-work of her father and mother, both artists by avocation. And now she brings to Mike’s studio the refinement of sensibility that work with cane requires and is essential in its tradition. If, dear reader, as you have trundled along to the water, you have never held the two or three sticks of a bamboo fly rod at your side, never felt their aliveness in your hand, if you’ve never felt how eager a cane rod is to get out there and work for you . . . well, you owe it to yourself to have that experience. It can change you. Kathy’s certain that cane, even the idea of cane, works its way on the clients who come in the front door. She’s full of praise for them, for their gentility, their courtesy, their deep appreciation of what they are about to do, get on a four-year waiting list for a Mike Clark fly rod. I could argue that at that moment of entering this inner sanctum of rod-making on Main Street in Lyons, Colorado, Kathy herself becomes a part of that rod-to-be — a part of the never-to-be-forgotten experience. The Master Builder in all his masculine rigor is one thing. But the feminine complement to the place, and in the rods, is the advocacy of art. Kathy notwithstanding, this is the work room of a master craftsman. There’s all the paraphernalia of rod building: the essential planing forms, the strange-looking varnish-dipping tube with its simple but sophisticated rigging for lowering and raising the rod joint, the lathe, the rod winding apparatus. But I’m always brought up short to realize how few tools and what minimal machinery cane rod building requires. It’s, in fact, pretty “low tech.” Low on tech and high on craft. And it doesn’t take much space. Mike, as a courtesy to the author, I’m sure, pulls open several large drawers full of supplies, myriad silk threads antique and new, the finest cork rings for grips I’ve ever seen, and in one a huge collection of ferrules, old and new, many from rod builders of the past whose rods may come in for repair or Kathy’s restoration. The entire craft of rod building is filed away in these drawers. This remarkable studio is an amazing blend of artifact, personality, and commercial enterprise; and only out of recognition of the current recession is there no longer the customary dozen American Beauty red roses on a counter out front. Mike has over the years had a good press. He’s been written about a lot. In fact one of those drawers he pulled open was liberally stuffed with press cuttings. So, his story’s been told, about the Mike Clark who began making rods 30 years ago after leaving big-time excavation and construction work, professing to want to get out of the “rat race” and into something that could really satisfy him. And, I suggest, something that would not deny the artist in him. He says he was willing to trade the affluence of his days in construction for the “poverty” of rod making. As did so many of our finest craftsmen and women today, Mike Clark came from out the tumult of the Sixties where rescuing the all but lost crafts of an older and simpler time could be a thumb in the eye of the managers of a sickening war and all the social ills and resentments that for so long had been accumulating on the late-American experience. I believe that we cannot otherwise understand the amazing renaissance of fine crafts that we find everywhere today. Mike seems almost as much a curator of a collection of valuable angling artifacts and memorabilia as he does a builder and merchant of rods. Yes, it’s like a tiny museum, a stepping out of time, out of the hurly-burly of contemporary fly fishing mania into a place where the great tradition as once we knew it is quietly nourished and protected, even insisted upon. And yet, Mike remains something of a mystery to me, something deeply private about him. I leave his studio wishing I had spoken better and asked better questions. I leave uneasy, wondering what he must be thinking of me. In his retiring way, Mike is running the show. It’s like the discovery of a lost time in American fly fishing. There’s surely the gratifying sense of stepping back into the greatness of the fly fishing tradition, to its Golden Age, untouched by the tubular carbon rod with which the contemporary angler “attacks” the water. Such is the spirit of this place. Kathy may praise the clients who come in the front door as paragons of angling excellence, but I suggest that just walking through that front door is a transforming experience for the client. And bamboo is the key. I suggest that bamboo can open up for the angler secrets of the most opulent pleasure.